If you have an event you would like to add to this page, CLICK HERE to submit your request. Course Content: Participants will explore and evaluate their personal values and beliefs. They will contrast Ethical "Types" and identify key ethical "reasoning" questions to apply to their behaviors. In addition they will recognize key, selected, excerpts from both Canons and Code of Ethics, and discuss and interpret what their behaviors should be when practicing in the field. They will also be shown the discipline procedures applied by both the ODRE and their Associations. Please RSVP to Suzanne Vazzano at svazzano@athensohiorealestate.com if you plan to attend the course and if you plan to attend the Realtor-After-Hours event. 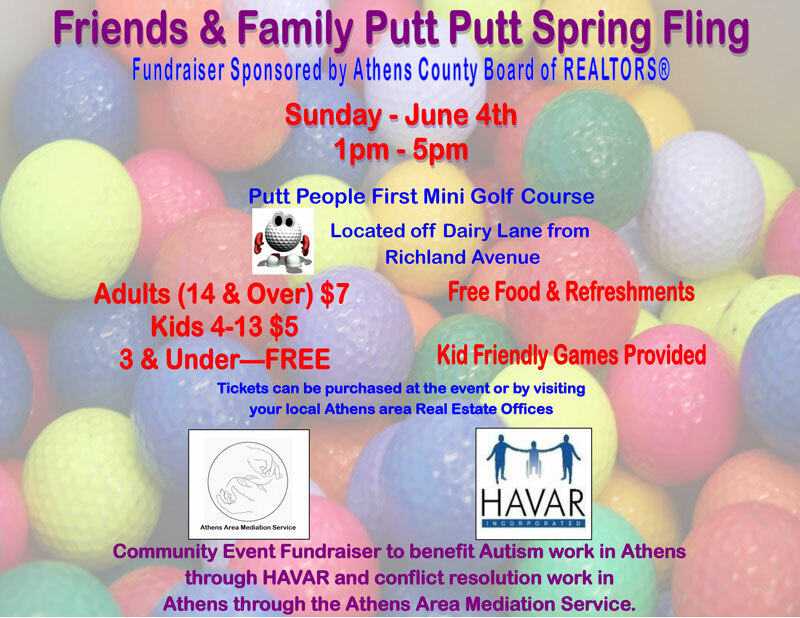 Community Event Fundraiser to benefit Autism work in Athens through HAVAR and conflict resolution work in Athens through the Athens Area Mediation Service. Tickets can be purchased at the event or by visiting your local Athens area Real Estate offices. JOIN US FOR AN AFTERNOON OF FUN! Please email Suzanne Vazzano at svazzano@athensohiorealestate.com if you have questions. Topic: Educate Realtors on the beginning remodel process through computer-aided drawings, project management and collaborating with resources. During the presentation there will be Q&A opportunities. Make sure to bring your challenging property questions to the luncheon.